A very simple and easy to prepare tangy and tasty curry loaded with garlic. An ultimate delicacy and treat for garlic lovers. The garlic cloves have a mild sweet taste. I learnt to make this from my mother. 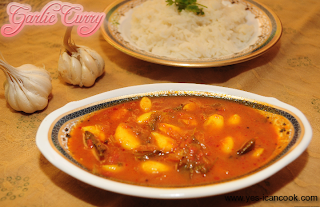 This curry can be served with plain steamed rice. It tastes good with idli, dosa and even roti. 1. Peel the garlic and keep it aside. 2. Soak tamarind in water. 3. In a cooking vessel heat oil. 4. Add mustard seeds and when they splutter add fenugreek seeds and curry leaves. Fry for a minute. 5. Add the chopped onions and fry for a minute. 6. Add the garlic cloves and fry till they start to turn golden. 7. Add ginger garlic paste and fry for a minute. 8. Add the pureed tomatoes. 10. Let it cook for 5 minutes. 11. Extract juice from the tamarind and add it to the curry. Cook for 10 minutes. 12. Add water as required to adjust the consistency. Cook for 10-15 minutes on low flame. 13. Garnish with coriander leaves.